Rebecca and Cecil run the Seed Shop in Clover Town. 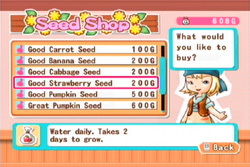 The seeds they sell can be planted on your farm fields. Once the crops have fully grown, they will be used in the Juice Shop. You can only plant 1 crop in 1 field. At the beginning of the game you'll only have 1 crop field to use. Grandpa Graham will unlock your second field after a day, and the rest of the fields can be bought at Takakura's Carpenter shop. Good seeds have to be watered every day or they die the next day. Great seeds can be watered every other day. Super seeds only need to be watered once every 3 days. The seeds that appear every day in the shop are random. When you buy an item from the Seed Shop, it will appear in your Rucksack. You can open your Rucksack by pressing the One ( 1 ) Button on your wii remote when you are outside of the shop. Daniel and Cynthia will eventually discover Fertilizer and Nutrient for your crops. Fertilizer will make a newly planted crop mature in 1 day, and Nutrient will make it so you don't have to water your crops for awhile.